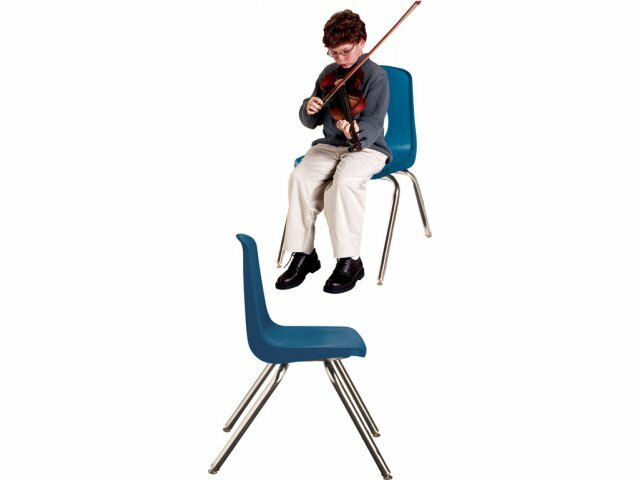 Help your students achieve that perfect pitch with appropriately-sized musician chairs. Band and orchestra members from 4th through 12th grade are sure to appreciate the support of proper seating..
Budding young artists can stay in tune with musician chairs from Academia. 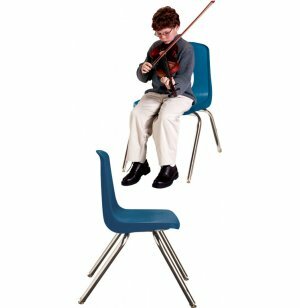 Unlike regular classroom chairs, music chairs are specially designed to facilitate healthy positioning while playing an instrument. Their polypropylene shells have waterfall fronts and vented backs to help musicians breathe more easily. The backs of these music chairs have been angled forward 5 degrees to provide proper posture during choir practice and musical performances. Academia musician chairs are as durable as they are comfortable. They are supported by 18-gauge steel frames with tubular steel back supports and 14-gauge steel under-seat brackets. They stack up to 10 high for convenient storage. Slight forward tilt facilitates easier breathing and provides proper back support for instrument players. Convenient Size: The 18"-high seats are just right for musicians in fourth to twelfth grade.